Earlier this month, some of the biggest names in music came together for the Made In America music festival. The multi-day Philadelphia festival was founded by Jay-Z, who also headlined. Jay-Z shattered the Rocky Stage with a blistering performance of "Bam." With Damian Marley right by his side, the Brooklyn MC's slick bravado had the crowd entranced. "Oh, it's gonna be a special night tonight," Hov said. The rapper then delved into earlier classics, including "PSA" from 2003's Black Album and "Heart of the City" from his notorious 2001 album, The Blueprint. Jay's flawless ability of weaving in and out of generations and providing multiple medleys, proved to be a shining point during his performance. First, he glided through "Moonlight" and his socially-charged record "The Story of O.J.," before skating past classic records like "Izzo" and "Big Pimpin'." Before closing out the night, the lights went dark, and many assumed the show was over. Instead, the man of the weekend surprised fans with special guest, Meek Mill. Meek Mill popped up and gave an earth-shattering performance of "Dreams & Nightmares." Hov returned on set and jumped into some more B-side records, including "Hola Hovito" and "Allure." To close things out, Jay recited his new poem, "Dream On," which perfectly encapsulates his rise from Marcy Projects. 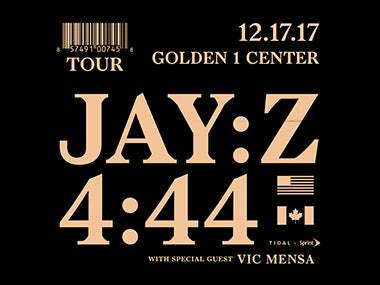 We can't wait to see what Jay-Z has in store for Sacramento this December!